The new film may seem unnecessary — and it is — but it actually does a bit more than just regurgitate the premise of the first film. Rating: 2.5 stars out of 4. But unlike the 1993 Bill Murray comedy, some people never learn from their mistakes, no matter how often they repeat them. Case in point: the sequel “Happy Death Day 2U.” The new film may seem unnecessary — and it is — but it actually does a bit more than just regurgitate the premise of the first film. The story begins at the fictional Bayfield University with Ryan (Phi Vu), a gifted science major, waking up in his car. After experiencing a sequence of minor incidents that you can bet will be repeated — a dog barks, a skateboarder nearly hits him, etc. — Ryan joins a group of friends at the high-tech lab where they’re working on what amounts to a time machine: the kind of spark-throwing electromagnetic behemoth that drives countless sci-fi films, and that in this case creates not only an unintentional time loop, but also alternate timelines in which the identity of a killer (yes, there’s another one) changes. At first, Ryan seems to be the focus of this crisis in the space-time continuum, but soon the young woman from the first film, Tree (Jessica Rothe), is once again the center of the film’s, and the murderer’s, attention. Together, she and Ryan must solve a new problem, which entails identifying one of several timelines as the “right” one. In these parallel universes, it isn’t just Tree who is threatened, but her friends. In the first film, repetition worked against the kind of tension that builds suspense. But by taking over screenwriting duty from Scott Lobdell, who wrote the original, returning director Christopher Landon finds inventive and unexpected ways to tweak the formula. For example, he leans even harder into a tone of satire that was only hinted at in the first film: Bayfield’s sports mascot — the Bayfield Baby, an adult in a baby mask — infantilizes the students who adopt the costume, reducing them to caricatures of infants, sucking at giant novelty baby bottles whenever the basketball team sinks one in the big game. 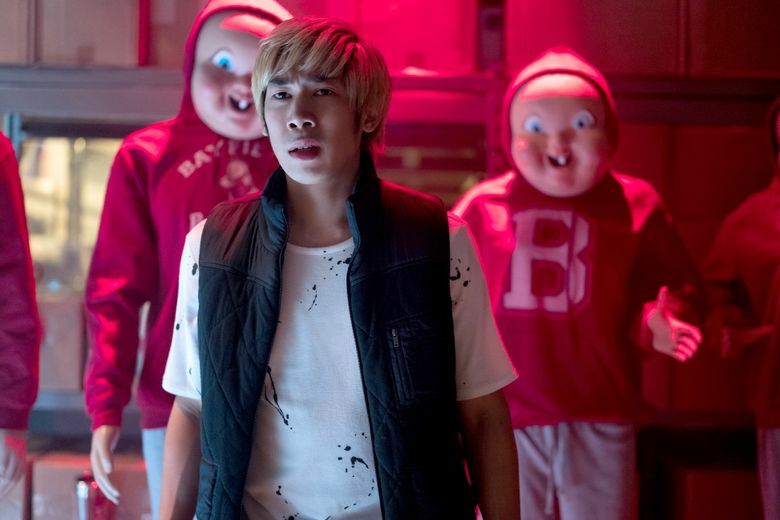 This time, “Death Day” has ambitions, posing questions that other slasher films wouldn’t touch. Is the self-absorbed Tree caught in a cycle of repetition so that she can become a better person? Or is she just collateral damage in some careless classmates’ ultimately meaningless science experiment? Ultimately, “Happy Death Day 2U” doesn’t live up to its aspirations. Landon’s script may be better than his direction, but he leaves a potentially resonant subplot — one that involves existential questions — flat and lifeless, as if our most important choices were of no more consequence than a joystick maneuver. ★★½ “Happy Death Day 2U,” with Jessica Rothe, Phi Vu, Israel Broussard. Written and directed by Christopher Landon. 100 minutes. Rated PG-13 for violence, language, sexual material and thematic elements. Opens Feb. 13 at multiple theaters.